Well, I took the 'beast' for a blast yesterday. Great bike with incredible power but i found it a hard bike to ride smoothly and it felt like it just wanted to bite you all the time. I think the brakes on the BMW are better as well.....more bite and grab. I will say the clutch was a lot shorter on the KTM and much easier on wrists. It handled incredibly well at speed and felt very nimble for a big bike (more so than my s1k). It's obviously faster in mid range but 2nd and 3rd gear are really short. 3rd, 4th and 5th gear are ludicrous and it goes like mad. Overall, it feels hard work to ride. Like it wants to rip your arms off all the time and as much as I would love one for blasting around on weekends, spending another 5-6k on top of mine for something that's arguably not much better, i'll stick with the s1k. BMW have made a great bike at a very competitive price and you can get one for a song compared to the KTM. Both my friend and I traded our S1000Rs for KTMs early this year. He got an R and I got a GT. First of all, resale on our S1000Rs sucked. It if the KTM resale is worse it’s not enough to matter. I traded an immaculate 2016 with 23,000 miles on it and got $7,500 for it. Less than half what of I paid for it. As to comparing the bikes, I am not going to say one is better than the other. The S1000R is faster and is ultimately the better sport bike. 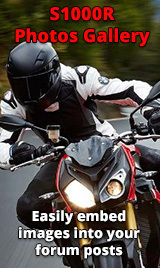 In my case, the GT is nearly as fast, handles nearly as well but has a lot more features and comfort for all day riding, which is what I do with the bike. If I did not also own an 1199 Panigale I might prefer the S1000R. But having three bikes, the SD GT is the better “middle”bike. BTW, I’m nearing 7,000 miles and have had zero problems with the KTM, nor has my friend. Only rode the gen.1 but the majority of the reviews I've seen say the gen 2 is a more cultured version with less engine braking and smoother throttle. If my local dealer hadn't shut down I would have give one a try.